Every startup is different and has their unique challenges. But, most startups have similar managerial needs. Today's lesson tackles typical roles and responsibilities within a startup. Although I am going to use C-Level titles for purposes of this discussion, it is not critical you actually use C-Level titles within your organization. Some people are motivated by them, and others are not. So, determine which titles are appropriate for your company's culture and personality. 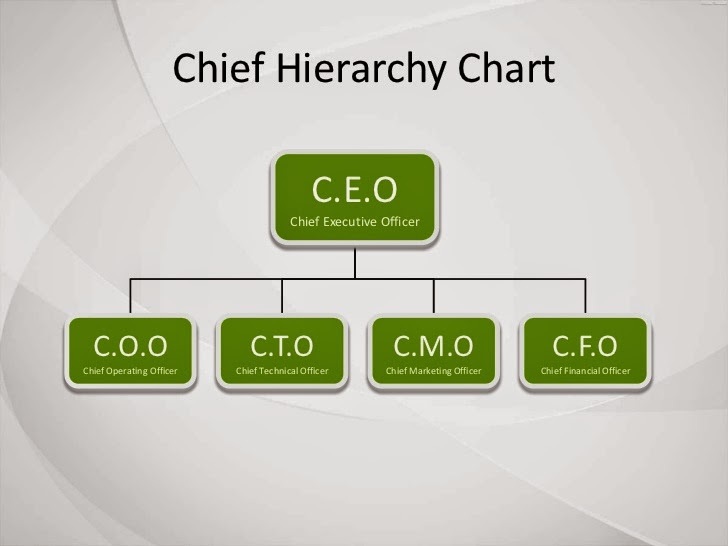 With that said, the typical roles within a startup's management team are: (i) CEO/President; (ii) CMO/CSO; (iii) COO; (iv) CTO; and (iv) CFO. Let's discuss the specific job descriptions for each. The CEO/President is typically the founder within a startup. But, that is not always the case. Sometimes, the founder is smart enough to know when their personal skills are lacking for ultimate company success, and they look outside of the company for their CEO. The summary is the CEO is the visionary of the business setting long term strategy and direction, and navigating competitive waters. The CEO is typically an outward facing role, meeting with key investors, partners and other strategic advisors. On the flip side, the President role is typically an inward facing role, managing the day-to-day operations of the business. In most startups, the CEO and President is the same person. But, when the company's growth can afford it, the CEO and President roles are split, to allow the CEO more time to focus on "steering the ship" and the President more time for "optimizing operations". The CMO or CSO of an organization is in charge of all marketing or sales driven activities of the business. This role can sometimes be called a Chief Revenue Officer, as without effective marketing or sales leadership, there will be no revenues. Most B2C businesses are marketing driven and would need a CMO. And, most B2B businesses are sales driven, and would need a CSO, which for a startup, is most likely one of the team's salespeople, as well as the sales manager. At the end of the day, whether it is a CMO or CSO, it is all about driving new leads for the business, as cost-effectively as possible. And, getting existing customers to close into repeat sales. In my opinion, this is the most important hire for the business, even more so than the CEO, as it will make or break your revenues. The COO is in charge of all the operations of the company, and in many respects is duplicative with the President role. The only real difference is the the President is also in charge of managing the other C-Level executives (e.g., CTO, CFO, CMO), as well as the COO of the business. Whereas, the COO is solely focused on operations. So, after the CMO or CSO brings leads into the business, the COO takes over to ensure a solid customer fulfillment experience. Think of the CMO/CSO is "pre-sale" activities with clients; and the COO as "post-sale" activities with clients. The CTO is in charge of all technology decisions for the company. This technology could be the entire lifeblood of a "dot com" e-commerce company. Or, it could be as mundane as the back office systems and software that keep the business functioning (e.g., finance, HR, CRM, call center, network). Obviously, the more important a role technology plays in your business, the more critical this person is to the company's success. The CFO is in charge of all financial, accounting, budgeting, cash management and reporting decisions for the company. This not only includes managing internal controllers, treasurers and bookkeepers, but managing relationships with any outside CPA's or bankers. In a startup, the CFO is also the controller and treasurer of the business, managing all accounting and cash decisions themselves, until the business gets to the scale it can afford a bigger staff. I didn't add a General Counsel to this organizational structure, since a startup typically cannot afford a full-time counsel. Instead, I would rely on your outside law firm for any legal assistance that may be required from time to time, until your business grows to the point its legal needs require full-time support. So, when you are pulling together your management team, make sure you are hiring with this type of organization in mind (or something similar, as this is not set in stone). And, make sure the individuals for the job have the proper skills required to succeed in a startup environment. And, worth mentioning, it is equally important this team gets along personally and shares the same long term vision for the business for the company to succeed.